With $100 Million MacArthur Grant, Sesame Workshop Launches Project To Help Refugee Kids : Goats and Soda In January, Sesame Workshop will start creating programs for Syrian kids who've had to flee their homeland. The goal is to help them deal with the "toxic stress" of refugee life. 'Sesame Street' has many versions around the world. Above: its new Afghan characters, 6-year-old Zari (left) and her brother, Zeerak. In January, Sesame Workshop and the International Rescue Committee will start work on what they're calling "the largest childhood intervention in the history of humanitarian response." Funded by a $100 million grant from the MacArthur Foundation, the project aims to reach 9.4 million Syrian refugees and local children in Jordan, Lebanon, Iraq and Syria through a new, regional version of Sesame Street and related activities. The show will be distributed via television, the internet and mobile phones, with related content given to childcare centers, to clinics and directly into the hands of parents and other caregivers in their homes. Sherrie Westin, Sesame Workshop's executive vice president of global impact and philanthropy, spoke to NPR's Ari Shapiro about the program. Here are highlights from the interview, which has been edited for length and clarity. Penetration of both TV and mobile in Syria and Jordan is huge, and that surprises people who don't fully understand that the largest number of refugees aren't in camps but in regular neighborhoods. We're able to reach children together with their new neighbors. Literacy, numeracy and the social-emotional skills that build resilience are somewhat universal. What makes the content most impactful for children in developing countries and places of conflict is that it's developed locally. The basic model is what Sesame Street has done for almost 50 years but making sure it's more reflective of their reality is what makes it so special. I can certainly imagine there will be a character who had to leave their home or who lives in a tent or becomes best friends with their new neighbor. 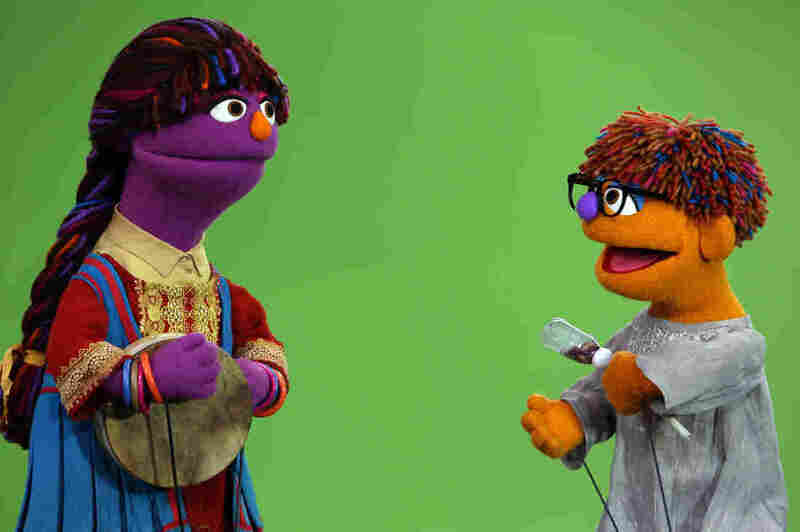 For instance, in Afghanistan the lead Muppet is a little girl named Zari. Girls' education is a real issue in Afghanistan. She wears her hijab with her uniform. A home visitor meets with a caregiver, training them on the most important way to help a child overcome trauma. There's so much proven science on this — that adult-child engagement is the most important thing. It's called nurturing care. It may sound intuitive, but when parents have been through this kind of situation they are very stressed themselves. We give them techniques and tools and strategies to help their children overcome the toxic stress — games, content, storybooks, apps, all sorts of things — but also an understanding of the importance of that nurturing care. We know from brain science that the impact of stress on a child in those first five years of life can have lifelong repercussions. When you look at all the aid going to the refugee crisis, less than 2 percent goes to education and a tiny sliver of that goes to the early years — understandable because most of the humanitarian response has been shelter and food and security. Giving young children social-emotional skills and resilience will help them regardless of what comes down the pike. We believe this will become the catalyst for refugee response to focus on children and not just on the other humanitarian aid.